Will BYOC support outbound trunk redundancy and failover? Can I use BYOC Cloud with PureCloud Voice? How does PureCloud know which trunk to route a given call through? PureCloud automatically creates default outbound routes. You can also create new outbound routes or modify existing ones. Number plan information and Add a new number plan provide information on the number plans associated with outbound routes. Locate and click your site on the Site Name list. Click the Outbound Routes tab. Enter an outbound route Name and a Description. From the Classifications list, select the appropriate classification. From the Select an External Trunk list, select the appropriate trunks. 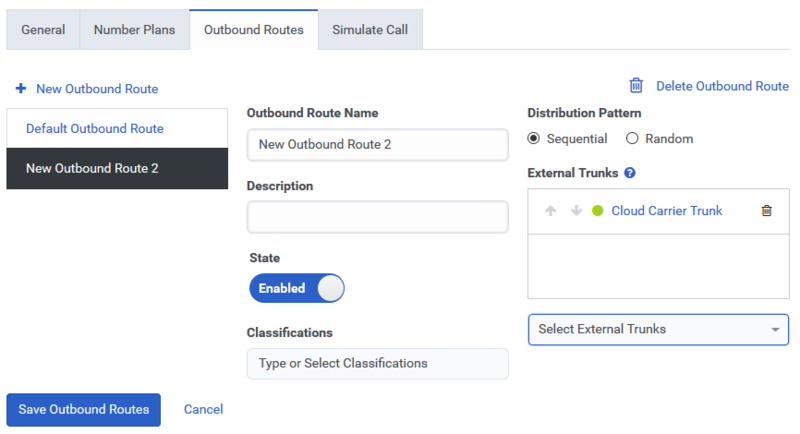 If you select more than one external trunk, you can specify a Distribution Pattern to define how outgoing calls are routed to available trunks. Select Sequential to route outgoing calls to each trunk in succession beginning with the first trunk. Select the Random to route outgoing calls to a randomly selected trunk. To enable the outbound route, set State to Enabled.